TM Google Site Analyzer 1.00 free download. Analyze site for Google. Analyze site for Google. This program allows you analyse your web site: get Google PagaRank, incomming and outgoing links for each page of your web site. You may vary the depth of analysis: get information for only level 1 links, 2 etc. TM Google Analyzer shows the size, backlinks, internal and external links, internal rank, Google PageRank for each page on your web site. By double clicking on the link address in the program grid you will get new window with 2 tabsheets. First tabsheet shows the HTML code of the page and document information like "Date, Server type, Transfer-Encoding, Content-Type". Second tabsheet loads this page, you may see this like in the web browser. Through the analysis you can stop the process, change the analysis level and resume the process. If you like you can export analysis results into HTML file. 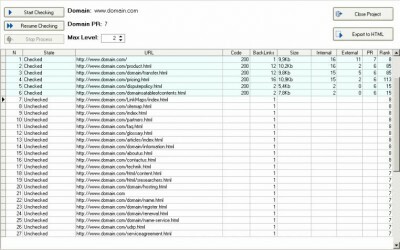 TM Google Analyzer saves your analysis projects with domain name you observed and you can load them later. Put the web address into the field, press Enter, get Google result. TM RSS Toolkit is a useful program that will collect rss feeds for checking and reading news. With Desktop Loan Repayment Calculator you can input source values, and then press the button to calculate the repayment amount. TM Desktop Metric Conversion Calculator is a simple utility which gives you the opportunity to get any measure conversion. PaRaMeter stands for "Page Rank Meter" - the meter of Google PageRank which is one of the web ranking important parameters. Wsa is a useful, free and powerful �Web Site Analyzer�, focused on finding and downloading files from the Internet. A free search engine optimization software by Jvw at google-ranking. Site Map Builder allows you to create the Google SiteMaps XML needed within your root directory in order to provide information about your site to Google. Run a submission campaign controlled entirely by you not the software The webmasters tool will only pre-populate web pages and not auto submit keeping you in control. eXpress PageRank Revealer is a small and useful program that allows you to retrieve the Google page rank rating for any given site, without having to install the Google toolbar, or even open your browser. Want to know why Google or Yahoo! ranks pages? If so this is the Firefox extension for you. Have you ever wondered why your competitors are ranked #1 in major search engines, while your own site is stuck on page 24 in Google? Not anymore! SEO SpyGlass will take the mystery out of why your competition are ranking well -- instantly! SEO SpyGlass is an extremely powerful competition research tool that is amazingly easy to use. PageRank of your pages is one of the main factor that decide of their positions in the results of search engines. MultiSearchPRO enables you to search for web pages from several search engines simultaneously quickly and easily. RomPhone 2000 is a aplication used to find online telephone numbers and addresses of the romanian people. This utility helps to find new sites all over the world.